We now have some evidence that suggests the first good video game movie could very well be on the way next year. Dwayne "The Rock" Johnson has shared the first official poster for Rampage, which is based on the classic 1986 arcade game of the same name. The poster gives us our first look at George, the rare albino silverback gorilla who will become King Kong sized in the movie and will be carving a path of destruction across the U.S. If this poster is any indication, we could be in for something incredibly fun with Rampage, which is set to arrive in theaters on April 20, 2018. The Rampage poster was shared by Dwayne Johnson on Twitter in advance of the trailer release tomorrow, which we now know will come out at 5 p.m. EST. Plan accordingly. The poster features his character holding a rather large gun, standing between George's legs. We see some smoldering wreckage on the ground and a massive city in the background. George's head is just out of frame, but what we do see looks quite impressive. Here's what The Rock had to say about it in his Twitter post. "This is my best friend, George. A rare gigantic albino Silverback. I love animals because they're honest. If they like you, they lick you. If they don't, they eat you. Our #RAMPAGEMovie trailer drops Tomorrow at 5PM EST/2PM PST. #BigMeetsBigger #GorillaLickage #RAMPAGEMovie"
For whatever reason, video game movies just simply haven't been good, going all the way back to the Super Mario Bros. movie in 1993. However, Rampage, as a game, didn't have much of a story. It just sees three huge monsters tearing apart cities. So, basically, this can essentially be a big, fun monster movie, which this poster is promising. If the trailer is this good tomorrow, we could be in for a pleasant surprise. 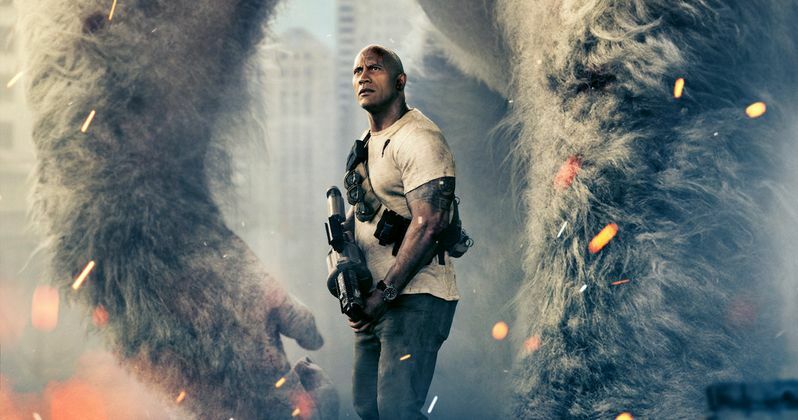 In Rampage, which is directed by Brad Peyton, Dwayne Johnson plays a primatologist named Davis Okoye. As The Rock points out in his post, he shares a bond with George, who happens to be an extraordinarily intelligent, silverback gorilla. However, a rogue genetic experiment goes awry, which transforms the ape into a raging monster, along with several other creatures around the world. They then carve a path of destruction, which is bad for those in the cities, but could be a blast for moviegoers. Okoye teams a discredited genetic engineer to make an antidote. They'll need to stop a global disaster, but also try to save George. The idea that Dwayne Johnson will have a connection with George provides an emotional anchor for Rampage, as opposed to just painting him as a mindless monster. Also, the "Big Meets Bigger" tagline on the poster is pretty perfect. Check back with us tomorrow for the first Rampage trailer. Be sure to check out the first Rampage poster, courtesy of Dwayne Johnson's Twitter, for yourself below. This is my best friend, George. A rare gigantic albino Silverback. I love animals because they’re honest. If they like you, they lick you. If they don’t, they eat you.